Using a Velvet Cherry Portable Wood Countertop Display Case from Store Supply Warehouse is an excellent way to maximize display space and improve sales. The case can be a powerful countertop or table top display, as the finished cherry wood frame features brass hinges, handle, and a shatterproof clear plastic top, both complementing the beautiful wood and attracting customers looking at the merchandise inside. Overall, the size of the countertop case measures 24" x 36" x 4", providing ample room for your fine watches, jewelry, or other stylish accessories. Each countertop display comes with 2 dowel rods to raise the top for immediate access to merchandise. In stock and available for immediate shipment. 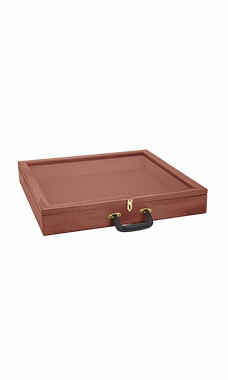 Case is well built, looks great and is made of solid wood. Nice addition to our business! It looked like they forgot to use glue on the corners when they made this case. It did not appear to be damaged in any way but all the sides were coming apart. I had to glue and nail them together and the case works fine now. Store Supply Warehouse did compensate me, the order was fast and easy. I will order again.